M is for Murder Investigations. Many persons in Cadblister Parva, some official and some not, are investigating Lord Cadblister’s murder, in one way or another. The Inquest was finally over. It had not been efficiently or even competently run, but after much labour, it had finally penetrated to the Coroner’s (in the opinion of Inspector Crowner) negligible intelligence that, contrary to village rumour (with which the Coroner was not even up to date), they did not have the murderer in custody, and that they did need to do further investigating. Once the Coroner had finally grasped this, he’d taken another ten minutes to adjourn the inquest for the customary three weeks. Now, Inspector Crowner sat back in the large chair behind the desk at the police station. He’d made more room in the small office by placing seats for Constable Wilkins and the three constables from Cadblister Magna inside of the holding cell. Sergeant Mug sat across the desk from Inspector Crowner. Arrayed before Mug were many different notebooks (each with a different colour of cover), pens, pencils, a map of the village, and a few as yet incomplete charts of timelines and alibis. “Let’s go over what we know,” said Crowner, sighing heavily. “Futile, of course, but I feel so damn dumb after that Inquest, I really don’t think I am capable of more useful cerebral activity.” He stared balefully at the constables in the cell. “Brain-work,” he translated, helpfully. “Yes, sir.” This was Constable Wilkins. “Sir?” Said Constable Garrick, a red-faced man who seemed always to be sweating. “The old lady in the coma,” said Mug, gloomily. “What?” Crowner was, for once, startled. “That’s Disraeli’s motto, not his,” said Crowner. “She’s a suffragette,” confided Wilkins to the constable on his right. He spoke with Dark Significance. Up at the Hall, the servants had been given a half-day, as the Crabtrees would not be in until the late afternoon, what with the Inquest and a grand tea at Colonel Crabbit’s that they would attend afterwards. All of the servants had therefore gone out. Or, rather, all of the servants save one. 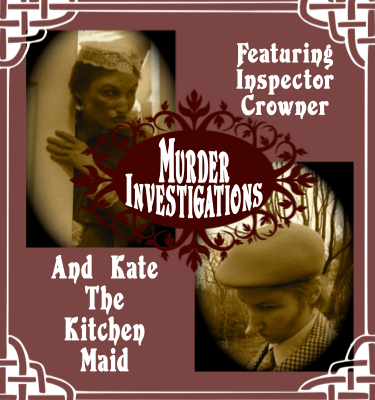 Kate the kitchen maid had pretended to be ill, to allay the suspicions of Mrs. Doombane, who would otherwise not have permitted her to stay at the Hall alone. Once the Hall was empty, Kate had risen from her bed, pulled on a pair of thin cotton gloves, and began an investigation of her own. She wasn’t, strictly speaking, investigating the murder. No, Kate was investigating the Hon. Percy Neville Bloater. Specifically, she wanted to know why he and Lord Cadblister had quarreled a few days before Lord Cadblister’s murder. Fannie the scullery maid had overheard part of this quarrel, and had told all the other servants about it. The other servants had told her to be quiet and stop putting herself forward. They had accused Fannie of dramatizing herself. In fact, they’d reacted in an entirely typical fashion- except for Kate. Kate had taken Fannie aside and asked for details. But Fannie could only tell her that the two men had gone into Lord Cadblister’s study and that voices had been raised. Lord Cadblister had called the Hon. Percy “dishonest” and “a disgrace;” Percy had called his uncle an “old skinflint” and “a mean old miser.” That was all Fannie knew. Kate wanted to know more. She wanted to find out enough to frighten Percy into leaving her alone. Therefore, as soon as the others had gone, Kate went to Lord Cadblister’s study- and to Lord Cadblister’s desk. This desk was a beautiful old secretary, and Kate knew it was just stuffed with secret drawers. She knew this because, last night, after Lady Cadblister had finally finished tearing the library apart, Kate had crept in, to read up on secret compartments in antique desks. Now Kate pushed and pulled and prodded, using her new expertise. There were indeed secret compartments in the desk. A hidden cabinet contained a bottle of what Kate suspected was immensely valuable brandy. The chamber underneath this hidden cabinet contained a photographic album that Kate put back in its place, blushing furiously, after a single glance at its contents – and a shake to make sure it didn’t contain any loose papers. There was a drawer full to bursting with the worst poetry Kate had ever read. And then Kate found a second hidden drawer. It contained only two documents, and these were of fairly recent date, for the paper was pure white, with no dimming at the hands of yellowing time. One document was Lord Cadblister’s Last Will and Testament, unsigned, and drawn up quite recently; the other was a cheque for a hundred pounds, from George Vivian Crabtree, Earl of Cadblister, to the Hon. Percy Neville Bloater. It was dated but a few days before Percy’s arrival. And Percy had endorsed the back of the cheque. Now, Kate did not know very much about cheques, having very little personal experience with them. At Cadblister Hall, she was paid in cash; previous to that, she was paid in bed and board. But she knew enough about cheques to suspect this one. Most cheques did not, after they were endorsed, end up in secret drawers. She suspected that this cheque was a forgery, and that Lord Cadblister had found his nephew out. But that was a job for Scotland Yard. If this cheque was a forgery, and if Lord Cadblister had summoned his nephew to the Hall to confront him about it, then it was, Kate considered, quite likely that the Hon. Percy was the murderer for whom the police were looking. And that meant that Kate was not going to say to Percy, “You lay off me or I’ll Tell All. For I know about the cheque! Ha ha!” For, if Percy had killed Lord Cadblister on account of that cheque, then Percy would probably kill Kate if she tried anything of the sort. And, quite frankly, Kate did not want to be murdered. There were so many books she had not read yet. Kate therefore closed up the desk, drew off her gloves, and coolly broke the most iron-clad of the many rules governing the conduct of servants at Cadblister Hall. She used the telephone. “Cadblister Parva Police Station, please,” she said. This is becoming very interesting. I think this lead is much more sound than Rundall and Verity as murders. Alex- Ah! Yes, the mistress… we will see more of her quite soon! And she might indeed have a motive- or a couple of different motives. By the way, we have met the murderer by this point – it would be cheating if we hadn’t, as we are half-way through the story! Or at least, I’d feel cheated as a reader if this were not the case. Katy Did- Hmmmm… indeed! Percy is featured in The Nephew, and today I will be writing The Other Woman, in which the mistress will be further explored. We shall see! Okay, now I remember who Richard is. Do we know the name of the Lord Cadblister who was just murdered? I can’t remember it.